It has been a while since I have posted on wine, but an interesting fact brought my thoughts to Spanish wines (not that they are ever far from my mind), a subject which is a particular passion of mine. The fact in question was that Spain became the world’s biggest wine exporter country by volume – overtaking Italy and well ahead of France. They achieved this by exporting in 2014 (September 2013 to September 2014) a massive 2.168 billion litres of wine. That really is an awful lot of wine, based on a standard 0.75 litres bottle. Even I would struggle to drink that in a year! The UK is one of Spain’s biggest wine markets and every wine merchant, supermarket, corner shop etc selling wine generally has a least one (usually multiple) Spanish wines on their shelves. I would bet my house that nine times out of ten that wine is a Rioja. Don’t get see wrong, I have a great and enduring love of Rioja. It can be a truly wonderful wine (and if you are looking for a good value reliable red, Rioja is your man), but there is so much more to Spanish wine than just Rioja. On the reds there are the glorious wines of Ribera del Duero and Priorat (and the less well known Montsant). Add to this wines from Penedes (better known for cava, but don’t neglect the reds) Toro, Bierzo, Valencia and Murcia to name but a few. They are even starting to make quality reds in Andulucia. 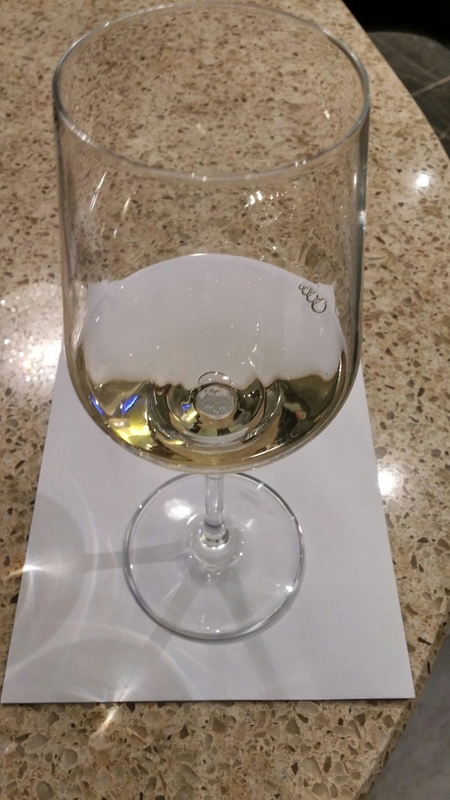 On the white front, most people think cava when you say Spanish white wine, but in addition to the amazingly good value and massively under appreciated sherry there is an increasingly strong stable of Spanish whites. 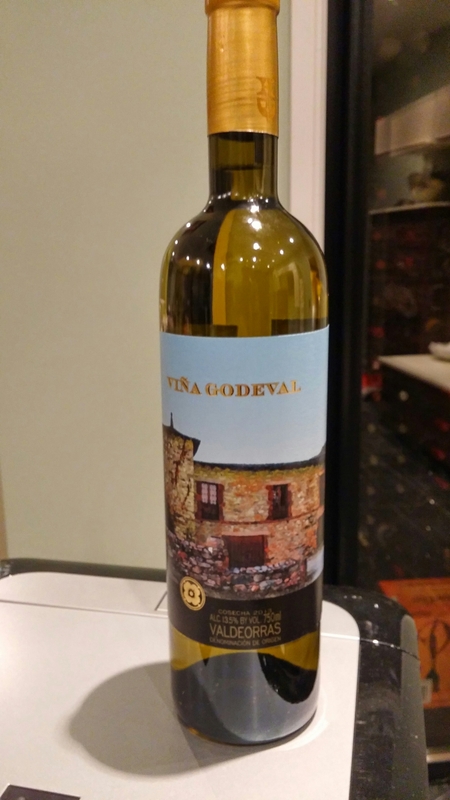 One of the fastest emerging Spanish whites is Godello (pronounced goh – DEH- yoh). The wine has the same name as the grape and is grown in the North West of Spain, with the principle growing areas being Valdeorras and Monterrei in inland Galicia. 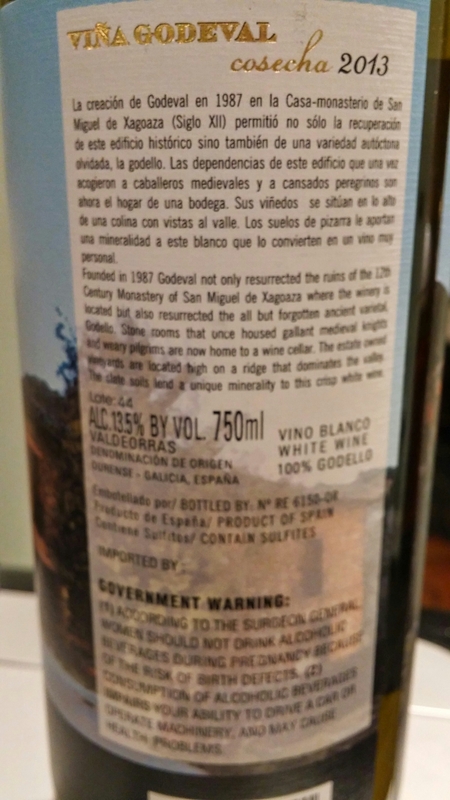 Godello very nearly went extinct with a mere 880 hectares of the stuff in 2004. (by way of contrast the Rioja DO has around 57,000 hectares of land under vine). Happily it is very much back in vogue with trendy wine makers, such as Telmo Rodriquez, making it currently one of the most fashionable Spanish white wines. Usually drunk relatively young, there is aging potential in the oaked ones. or, that Galician staple, pulpo (octopus). 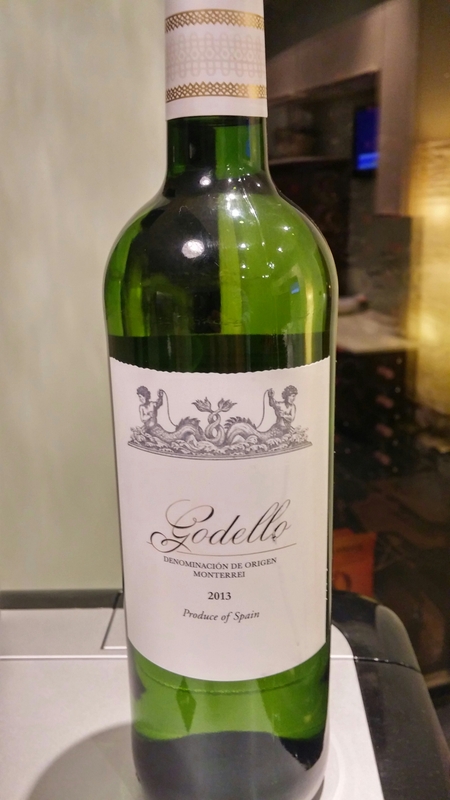 On perusing the wine shelves of Marks and Spencers (in my view, the best large high street retailer for wine these days – beating Waitrose at the moment), I spied a stock clearance offer on a Godello so snapped it up. I also picked up a bottle of the stuff from Costco (great for wine if you are a member, with a good selection offered at very reasonable prices). This wine is from the Monterrei DO, a small wine producing area which abuts the Portuguese border in the South East of Galicia. It is a relatively new and small DO, having only been established in 1996, and Godello is its star attraction. This wine is bottled for M&S by Bodega Pazo del Rey. 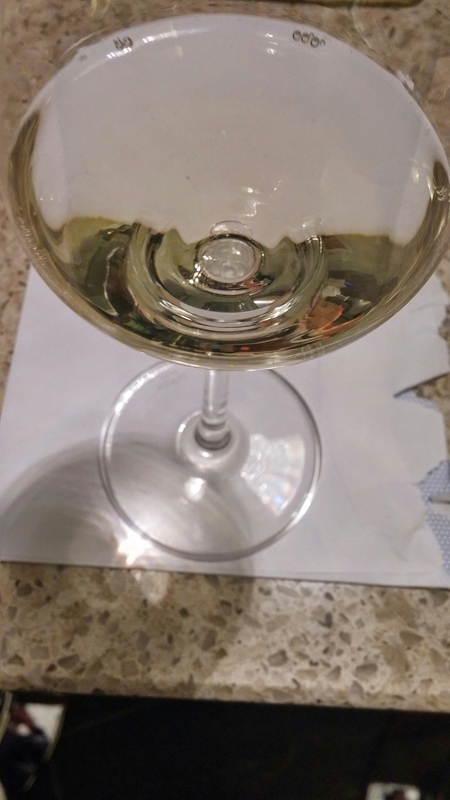 This wine had a light golden colour in the glass. On the nose there were nice aromas of fresh green apples and a hint of floral (honeysuckle) and spice. All very pleasant, with the promise of more. On the palate, the initial dominant flavour was of crisp apples, but this developed into zesty lime with a back note of melon as the wine lingered nicely on the palate. After being left in the glass for a while the melon flavours became much more pronounced added a bit more complexity to the mix. What it was perhaps lacking was the minerality of a really good Godello. All in all a very satisfying wine, excellent with or without food and with a lightness that belied its 13.5° alcohol level. 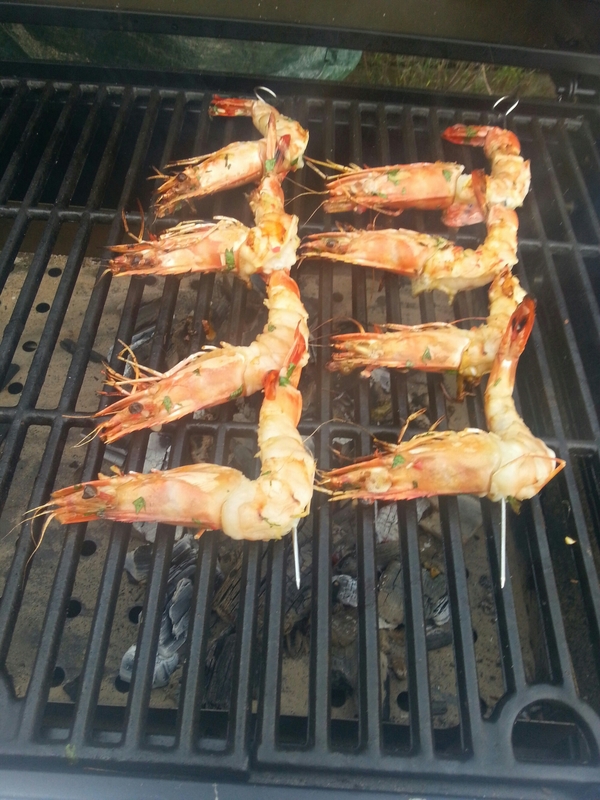 Drink on its own or with some fresh grilled prawns or scallops. I thought this reasonable value for the original £10 price tag (I would have paid that price for it – but suspect it selling in the £10 plus bracket may have put a fair few people off) and is certainly a bit of a bargain at the stock clearance price of £5.99. My advice is get this stuff before it is gone, as it’s really rather good. Personally I think M&S are foolish to de-stock it – if they had shaved 75p or better still £1.05 off the original price and it may have sold better). This wine come from the Valdeorras Valley , which means “Valley of Gold” – due to the stuff being mined there by the Romans amongst others. Valdeorras is a larger and much more established (1956) DO than Monterrei. Whilst other grapes are grown here, including the red wine grape mencia, it is godello where it really excels. 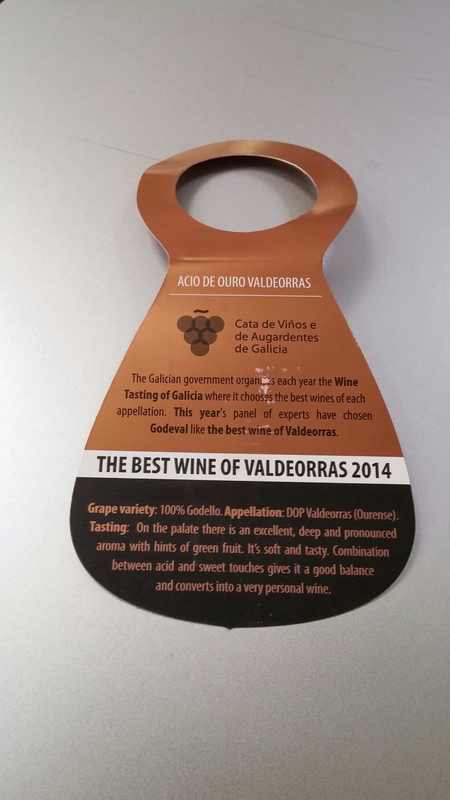 Godeval is one of the star producers of Valdeorras and their Godello wines have received critical acclaim. This wine had a lovely light golden hue to it in the glass. On the nose there was plenty going on with aromas of lemon and lime together with some herbal notes. As with the M&S bottle, there was apple but here it was distinctly sweeter (red/yellow rather than green apple). Really rather lovely. On the palate it echoed the nose but had a slake of minerality to it and a very pleasant mouth filling quality, as well as a nice thirst quenching acidity. Great with fish, this wine would still work where the fish has a rich sauce with it. This is a top quality wine that is a notch about the M&S wine. It is thus surprising that it is (when both are at non discounted price) the cheaper of the two. To me this wine is a real bargain that should be snapped up if you see it. Looking to try something different on the white wine front? If so I would strongly urge you to try Godello. Buy it before everyone else catches on. 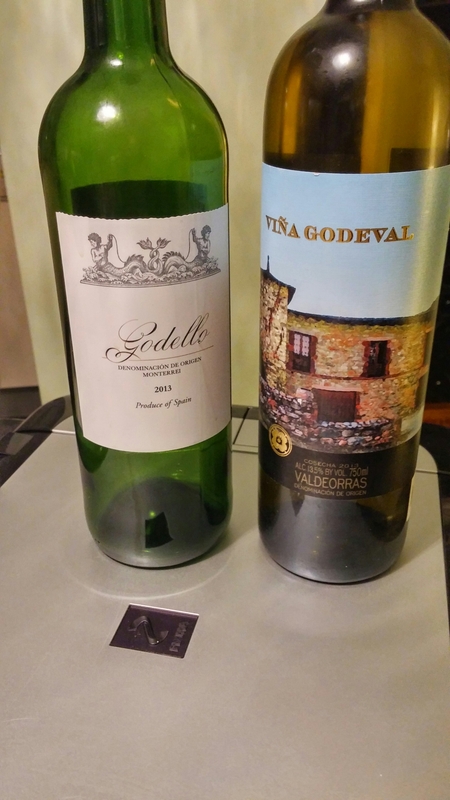 Of the two, the Vina Godeval was the clear winner and super value at the Costco price of £9.22. Nothing wrong with the M&S effort either mind which is very good for the discounted £5.99 stock clearance price. Majestics stock a Godello as do Morrisons (as part of their M – Signature wines ) and Waitrose, if you can’t locate the M&S one or are not a Costco member. Not tried these mind , so can’t vouch for their quality. It is rare, however, to find a poor godello so suspect they are good. I predict this wine will go from strength strength, despite M&S’s strange decision to de-stock it. I suspect it will also start to appear a lot more on restaurant wine lists (good ones, in the know, already do so). As the title suggests, this is a wine that is going places. Have you tried the As Sortes? It is oaked, but a thing of beauty IMHO. Not tried it am afraid, but anything the Palacios dynasty touches is usually gold (and as expensive). I did pick up some of their menicas (Alvaro and his Nephew) in Spain last year in lovely wine shop in Donostia (which is top stuff) but not got around to trying any of Rafael’s godellos yet ;( Asked if they had any and he shrugged and said Basques only drink reds or Txakoli !! Thank you – much appreciated. Still not that easy to get hold of it in UK but seems to be gaining a bit of traction at last. 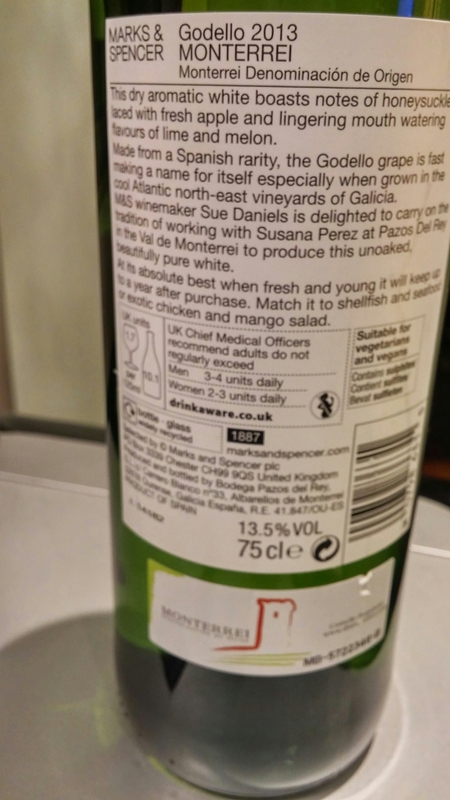 This entry was posted on Apr 12, 2015 by solicitingflavours in Alternatives to sauvignon blanc, Cardiff, Costco, Drink, Food and wine products, Galcian white wine, Godello, M&S, Marks and Spencer, Spanish wine, Supermarket wine, Wales, White wine, wine, Wine Merchant.